Innocent enough children’s rhyme, right? Hold hands and dance around in a circle before falling to the ground and giggling. Yeaaaa!!!!! Like many children’s rhymes, songs, and poems, this particular rhyme contains a hidden meaning. In medieval Europe, they had outbreaks of the plague. The first symptom was a circular red sore (ring of roses). As people started dying, the bodies piles up in the streets. The stench was unbearable and some people put herbs and flowers around their neck or in pockets to try and mask the smell of decaying flesh (pocket full of posies). When the bodies were burned, the ashes would rain down on the city, on young and old alike (ashes, ashes). Ultimately, many people could not escape the plague and ended up dead (we all fall down…dead). Wonderful. And kids sing this like it’s the happiest song ever. After having kids of my own and reading many of these poems and songs, I realized just how many of these things have a deeper darker meaning. Like many things from hundreds of years ago, this rhyme has several meanings, but the version I like best is that the duke is Richard, Duke of York born in 1411. There are a few other contenders like James II born in 1633 and Prince Fredrick born in 1763. The next rhyme may be from Shakespeare’s Twelfth Night. There are many theories as to the meaning of this rhyme. One popular theory is that it originated in America in the 1600s when colonists saw Native American women rocking their babies in birch bark cradles swung from tree limbs. The idea being that the wind would rock them to sleep. However, the poem first appears in print in England in 1765, so this would appear to invalidate the American ownership. Another theory comes from a local legend in Derbyshire England where Luke and Kate Kenyon lived with their eight children in a huge Yew tree. They hollowed out one of the limbs for a cradle while Luke made charcoal in Shining Cliffs wood in the Derwent Valley. This post is by no means exhaustive on the subject, and I only did my research online. But I hope I have been able to illuminate some commonly sung rhymes that we memorize when we are kids and don’t know the hidden, darker history to. As always, I’d love to read your thoughts and reactions. Thanks! 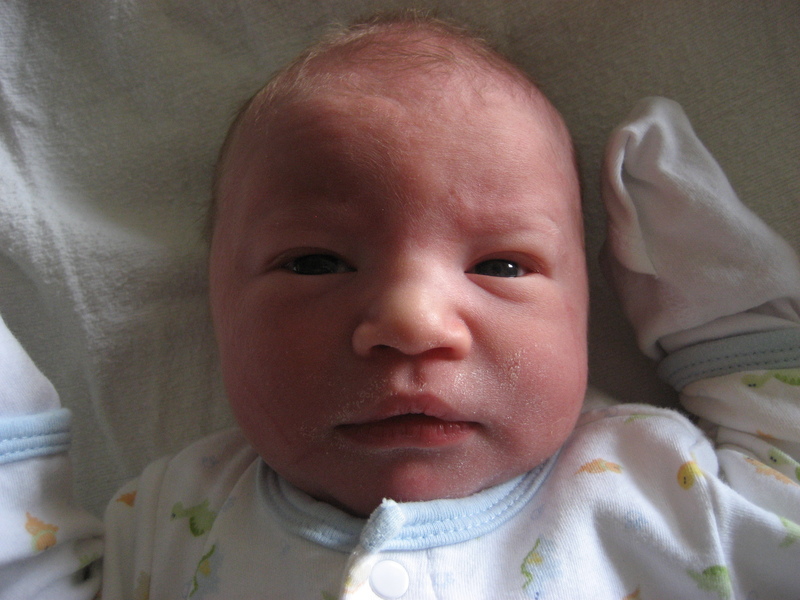 Nathan Roarke was born yesterday, coming in at 9 lbs. 6.8 oz. and 22 in. long. 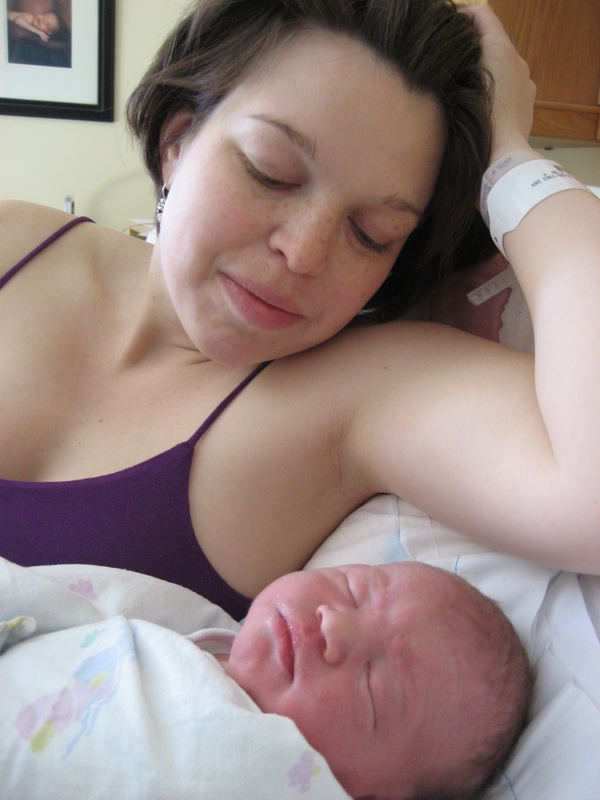 My wife is a champion at natural childbirth! No drugs or anything. The labor went well, but it’s not called labor for nothin’. It was work. But after 10 minutes and 4 pushes, he was out. ( I hear second children are faster that way. )Still, the entire labor was long and we were both up for more than 24 hours. Exhausted doesn’t begin to explain it. But we are very happy and thankful that both mother and baby are healthy and safe. You may have to endure a proud parent bragging here. That said, I wanted to document my son’s development more for my own remembrance than anything else. He is one smart little boy. His vocabulary has expanded exponentially from what it was when I wrote about it here, at 16 months. Back then he was saying one word at a time. Now he is speaking in 5-6 word sentences. Things like: “Daddy, Andrew’s mower right there!” His other oft repeated phrases are: “Go again.” “Open it.” “Daddy bike, Andrew bike…helmet.” etc. He will usually repeat a word if he hears it once now. He also surprises us with things like, “Grocery store.” when we are pulling into the grocery store parking lot. He can also count to 12. Yes 12. We were counting with him one night, and I expected him to stop at 3. I figured 1..2..3 was pretty good for a kid not even two years old yet. But he kept going until we got to 10. Then I really expected him to stop. I mean, most baby counting books only go up to 10. That’s how many fingers you have, right? What under two year old knows more than that? “Eleven.” he said, clear as day. Lydia and I looked at each other like, “How does he he know that! ?” “Twelve.” Well now we are just stunned. But that was a far as he went. It turns out that the lady at daycare has twelve stairs that the kids count going up and down every day. Today was the first day that he joined in and sang several portions of the ABC song. He usually gets ABC and then comes in again at LOP. But today he got most of the letters. Pretty cool. And he can carry the tune! Just a quick note. My son sang his first song yesterday. He was babbling like he usually does. But then we paid attention. He was only say “do do do.” but he definitely sang “Twinkle Twinkle Little Star.” He got the right number of beats, his timing was right, and he even gave mostly the right pitch to the notes. This is pretty exciting as I have some musical talent. It’s nice to know my genes contributed something to the mix. I may be getting a job. Since I left me last job in August, I have been watching my son two days a week and working on the house the rest of the time. Also lazing about a bit. Since my wife had 15 months off while I worked, I don’t feel bad about this. I had planned on looking for a job after I finish my degree at OCC in December, but after talking with a friend, I submitted my resume to the place he works. I went in for an impromptu interview last week and got a job offer today. Unfortunately, I have to watch my son these nest two days, so I was unable to act immediately. This may have cost me the job, but the manager said that he has a few other positions open as well and I may still be able to start Monday. During the past few years, my wife and I had gotten used to never worrying about money. She had a teaching job and I was making a much as I could hope for with only a High School diploma. We had saved up quite a chunk for a newly married couple ($25,000) and planned on using this when she took a year off with the baby. This saved us because midway through that time, my position was cut to part time. We basically lived off savings for the rest of the summer. Now she is working again but I am still home. Money is still tight although we have never missed a payment on our mortgage or school loans. I wouldn’t say we argue about it, but we can order anything off the menu at restaurants anymore. We can’t go out to eat at all anymore. Maybe twice a month, max. No movies, only free DVDs from the library. But now I have a chance at a job. I realize that this is rare in this economy, especially for someone who has no practical experience in the field that this company is in. So when the interviewer asked me what salary I think I should receive, I told him that any dollars/hr is better than no dollars/hr. This job will be different than anything I have done before. More of a factory position than working at a desk. This is part of what attracts me to it. I enjoy working with my hands and want to be able to leave work at work at the end of the day. I am looking forward to the sense of security that this will bring to our finances. I would also like to say that I never worried about money because I knew God would take care of our family. There have been a few times we were low on funds and out of the blue, a check would come in the mail from some obscure thing we were not expecting. Like an alumni fund or extra cash from our escrow account. Anyway, I hope to post a positive update soon. My wife is one of the least sneaky people I know. When the baby is sleeping, she will just walk down the stairs like normal, not bothering to skip the second step (which is squeaky) or stepping to the inside of the 4th one (also squeaky). If she’s going down to the basement to do laundry, she will just wrench the door open, not pull up first, so that it opens quietly. So I find it very frustrating when I am trying to be quiet and the baby still wakes up if I step on a board wrong, but will sleep quietly with her banging around somewhere. no: no, sometimes he means yes, though. Oh wow: when he learns something new. Now every time he takes a drink from his cup, he says, “Ahhhh.” I rate it a 9 on the cuteness scale. A few nights ago, I heard the sound that new parents fear in the middle of the night. A big bump, and then crying. Andrew climbed out of his crib in the middle of the night. I threw the covers off and ran in to find him lying on the floor, crying and shaken, but no worse for wear, at least as far as I could tell. Just about a month ago, I lowered the mattress to it’s lowest setting so climbing out would be harder for him. Obviously, it didn’t take him long to find a way to power up and over the railing. I mean, the top of the rail is still at chest height on him. I thought that would be enough. It wasn’t. So we made the decision that we would rather deal with a new crib set-up and an altered bedtime routine (again) than have him fall out of the crib for a second time. I measured where the new rail would be, and Lydia got the old bumper rail that went on her bunk beds from her parents. I think it turned out rather well. I just need to stain it to match the color. Andrew can climb in and out and there are cushions there if he falls out. The bad part is that now he can climb out of bed and walk into our room. We just got him used to falling asleep on his own by using the progressive waiting method. (one of the best thing we have done, by the way) Now, his routine is changed, but he won’t be falling four feet down onto hardwood floors anymore either. This was Andrew’s first time at the Scottish Games. He had a blast listening to the bagpipes. We even got to be in the parade of Clans, representing Donald of course. My wife made his kilt out of the material I used for my own homemade kilt for prom 10 years ago. It’s the MacDonald dress tartan. my life is in large state of flux, and I like it. My life is going through some rather large changes at the moment. The biggest of these is that I have just given my two weeks notice at my job that I have had for the better part of a decade. Yes, after nearly ten years, it is time for me to go. So…I’m crazy right? I just quit my job in a terrible economy. My wife is also not working. We have a one year old who still needs to eat. What am I doing? Who knows? I just knew I could not stay at my job any longer. What started as a great career leading groups through a ropes course, being outside and working with my hands, has led to me sitting behind a desk for 8.5 hours a day, filling out government forms and shuffling papers around. Enough was enough. While I am not naive enough to think that I can make it as a professional writer (seeing as how I’ve not been paid for one single word I’ve written so far) I still hope to get my novel published. I’m sending it out to agents right now. That would be super cool. But it will continue to be a side hobby until it really pays off. I imagine I will just do odd jobs until I can find one I really like. I always liked working with my hands, but I don’t have a trade, per se. I can do carpentry, but I wouldn’t call myself a carpenter. If you have a specific set of skills, you will almost always have a job available to you. But I don’t like my skills as a Workers Comp and Disability form filler-outer. I want something new. I am blessed with a smart wife with a good job, so I can afford to take a little time to look for just the right fit for me. I will also be finishing my Associates Degree in Business this December from OCC. This will help me if I ever want to get another desk job, which at the moment, I do not. The other big change, or area of weakness on the fault line of change, is church. Ahh church. The peaceful serene escape from our worldly life and a bright shining respight from our toils on Sunday morning. Yeahhhh, or not. There are several issues that we are dealing with, but the biggest of these is childcare/ nursery. To make a long story short, our congregation was kicked out of the building we had used for over a hundred years by the Episcopal church. We are now in a storefront space. The people who own the space are very gracious and are letting us have church there for free. The space next door is available with the same situation. However, it was never meant to be a baby-safe nursery. There are big metal bookshelves with exposed edges, a carpet that is so dirty it turns Andrew’s knees black when he crawls on it, and a door leading out to a busy street that a baby can push open and crawl out of. Due to many factors, we don’t see this situation improving much, so we are kind-of looking around at other churches right now. The sad thing is, we like the service and the teaching there. But there are other issues I won’t write about here that contribute to the fact that we are looking elsewhere. So I will soon be out of a job, and possibly going to a new church. Big changes. I know that there are downsides to socialized medicine, (and please feel free to tell me what they are) but I want to write about the upsides, and maybe the sidesides. From my uninsured, and non-expert opinion, I think that the U.S. having Universal Health Care is a good idea. The main reason is that we have 50,000,000 people who are uninsured right now. We live in the richest nation in the world, and yet 16% of our population can’t get the help they need when it comes to health problems. The United States pays the most for health care, more than any other country, yet on almost any scale you choose to measure, we rank last. Out of Australia, Canada, Germany, the United Kingdom, New Zealand, and the USA, we rank last on quality care, access, efficiency, equity, and healthy lives. I started getting interested in this subject when I got Michael Moore’s “Sicko” out from the library. Now I know what you’re thinking. Maybe. So I also watched this Frontline report that also tackles the issue of Universal Health Care with a more dispassionate, intelligent approach. T.R.Reid (Washington Post reporter) goes around to the second and third wealthiest nations, among others, and investigates their health care systems. He evaluates each system on how much it costs to the public, the effects on the insurance and drug companies, the level of care, and most telling of all, how many people in that country go bankrupt every year from medical bills. ( None, as opposed to 700,000 in the U.S.) He tries to take the best of each program and apply it to the U.S. One of the interesting points was that not all countries have total government owned hospitals. Japan and Germany have privately owned doctors offices, hospitals, and insurance companies. Hmm, maybe we can do this in America after all. When most people hear “Universal Health Care,” they automatically think, “Total Government Control! Big Brother! Waiting months to see a doctor!” The reality is much less alarming. In fact, we already have government run health care in America. Just look at the care we provide our Veterans. Putting the scandal a few years ago aside, the network of VA hospitals offers some of the best care in the country. Don’t believe me? read this excerpt about the VA. The Annals of Internal Medicine in 2004, published a a study that compared Veteran’s health facilities with commercial managed care systems in their treatment of diabetes patients. In seven out of seven measures of quality, the VA provided better care. A RAND Corporation study published in the same journal concluded that VA outperforms all other sectors of American health care in 294 measures of quality. One of the big complaints that people have with government run health care, is that people have to wait a long time to be helped. Really? Cause when I took my Mom to the Emergency Room at a local hospital in NY with a severe cut to her forearm at 10:00 p.m., we had to wait until 3:30 a.m. for her to be taken care of. And it was not a bustling downtown ER with gunshot victims. I find it hard to imagine that we would have to wait more than five hours to be seen somewhere in Europe. From what I’ve read, seen, heard from friends, and (gasp) in fact experienced myself, medical care overseas is prompt, professional, and cheap. When I traveled to Ireland, I got in infection (sparing details) that made my ears feel like I was fifty feet underwater. We went to a small clinic in a seaside village where I was seen immediately. I was a foreigner, and yet they saw me right away, proscribed medicine, and only charged me seven pounds ($15). If the situation were reversed, I’m sure that the sick Irishman would have to pay at least $150 for the appointment, that is, if they agreed to treat him in the first place without the consent of an American insurance company. I’m going to post this now, but will be adding to this article as I learn more. My son just turned one and he is a prodigious climber. He is a beast of a baby too. He doesn’t even use his legs to climb up onto chairs. He just grabs both edges and pulls himself up using only his arms. It’s beginning to be a problem because he is so quick that if we don’t see him for 20 seconds, he will be up the stairs, climbing the toilet, and IN the sink banging on the mirror. I’m so glad that I keep my straight razors in a separate rack high up off the floor. It is becoming very tiring keeping up with him all day. He’s also starting to walk too so maybe that will tire him out just enough that we can catch our breath.